Three Bourbon Tours That You’ll Want To Take In 2018. We hear it time and time again. At the neighborhood liquor store with owners trying to keep up with customer demand. We hear it at posh bars that feature signature high-end cocktails. At local taverns that prefer to serve it straight up. And at distilleries from Frankfort to Hopkinsville and all points in between. It’s no secret. The current bourbon boom is sending sales of Kentucky Straight Bourbon Whiskey through the roof. And this current surge is showing zero signs of slowing down. The best evidence can be found in the number of new bourbon distilleries set to open in the next several years. Just when the most seasoned whiskey warriors thinks they may have conquered every stop on and off of The Kentucky Bourbon Trail® (and earned every passport stamp imaginable), another unique and inviting location opens its doors. The three new distilleries featured here are either already welcoming visitors or are scheduled to be open by late spring. As with the current roster of distilleries throughout Kentucky, these operations come in all shapes and sizes. Each one with its own style, story, product, and history. Some are introducing new labels, while others are resurrecting brands from a past era. And, of course, Mint Julep Tours can take you there. After all, there is always something more to see. One of the most anticipated new bourbon distilleries is also one of Kentucky’s oldest. Nestled along Glenns Creek near the tiny town of Millville, Kentucky, the Castle and Key Distillery has been creating bourbon buzz before it even had a name. And once you spend just three minutes in front of the main entrance, it’s easy to see why so many are enamored by what was known for over a century as The Old Taylor Distilling Company. The castle façade, built in 1877, looks as if it was lifted directly from a medieval fantasy. And this is just the entrance to a remarkable property that’s being brought back to life one careful history-preserving step at a time. Today, the distillery is in full operational mode. Modern distilling equipment reliably hums side-by-side with slightly-rusted gear that hasn’t been used in over forty years. One of the most jaw dropping features is the one-of-a-kind 530 foot long bourbon aging warehouse which is twice as impressive on the inside as it is from the outside. But most notably, Castle and Key is also the only distillery on our list that you can tour today! Now, Castle and Key is currently offering “Restoration Tour” experiences that focus on a behind-the-scenes look at the distillery as it stands today. While the visitor’s center and distillery is still months away from throwing open their gates to the general public. In the meantime, this tour offers insight to the extensive work being done under the watchful eye of Master Distiller Marianne Barnes. Plus, you can claim bragging rights by being able say that you saw Castle and Key before nearly anyone else. Tours are limited to small groups and only available for a short time. Book here or work with a Mint Julep Tours experience coordinator to add it to your custom bourbon tour. During this past year’s Kentucky Bourbon Festival, a very symbolic if mostly overlooked ceremony occurred in Bardstown. An engraved stone was installed on the Bourbon Capitol Compass featuring The Lux Row Distillery. The Compass, located in the exact middle of town, already featured distinguished distilleries from around the state. Far more permanent than any press release, this was an official Kentucky welcome to Rebel Yell, Ezra Brooks and other brands to the land of bourbon. When the St. Louis based Luxco Inc. decided to bring their portfolio of American Whiskeys to Kentucky, Bardstown must have stood out as the logical choice. Setting up in “The Bourbon Capital of The World” sets the new operation up nicely next to long established distilleries. Neighbors like Heaven Hill, Barton, Willett and other distilleries. The Lux Row Distillery, with a projected price tag hovering around 40 million dollars, is already turning heads. 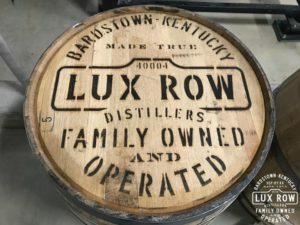 Lux Row sits on 90 acres of land making it one of the largest new distilleries scheduled to open in Kentucky. The property will be home to multiple six-story rickhouses that hold 20,000 barrels each. A large distillery on site has the capacity to distill upwards of a million proof gallons a year. The grounds will also include an expansive visitor’s center. Visitors will start their visit by entering down a long tree-lined drive. And there is even a historic 19th century farm house on site. Lux Row designed bluegrass beauty to go hand-in-hand with bourbon. The distillery will be the new home for Rebel Yell, Blood Oath, Ezra Brooks and David Nicholson bourbons and is expected to open for tours, tasting, shopping and more this April. The “Pepper” family name is one that has deep roots in Kentucky Bourbon history. Three generations of Master Distilling Peppers – Elijah, Oscar, and James – had a tremendous impact on the industry throughout the 1800’s. Each distiller oversaw innovative distilling practices and fostered exponential growth of whiskey sales. James E. Pepper established his namesake distillery in 1879 at its current location in Lexington. Much of the facility still stands today just one short mile from downtown’s Rupp Arena. After years of booming production, the entire operation shut down in 1958 in the face of waning national bourbon demand. The location sat quiet and empty for decades. But 2018 is a landmark year as a significant Kentucky brand name is getting a fresh start. New owners are bringing both the history and bourbon of James E. Pepper back to life. Unlike Castle and Key, very little usable infrastructure of the once behemoth distillery had remained intact over the last 60 years. But like so many other new operations, the rebuilt and restored distillery boasts a column still that was custom built by Louisville’s acclaimed Vendome Copper and Brass Works. The Pepper distillery already has some popular neighbors including Crank and Boom Ice Cream, Goodfellas Pizzeria, Ethereal Brewing, and The Barrel House Distillery which all share space in The Lexington Distillery District. The small distillery is officially online now and reached a critical milestone by filling their first barrel in late 2017. The James E Pepper Distillery plans to open for tours this spring. The distillery will also feature a museum dedicated to the larger-than-life founder and a collection of historic materials. These spots just represent the proverbial tip of the ice in the rocks glass for new bourbon projects. Other exciting openings on the horizon include new companies like The Bardstown Bourbon Company and Louisville’s Rabbit Hole Distillery in the NuLu neighborhood. In addition, Louisville will be home to the much anticipated Old Forester Distillery on Whiskey Row. And recently Bulleit recently announced they would be adding a tour experience at their new Distillery near Shelbyville. Most of all, the future of bourbon tourism offers a bevy of news spot that will keep offer visitors with a full itinerary. That one day trip you’ve been planning to Bourbon Country might just turn into a two or three day affair in 2018!